Urban and economic geography; migration; labor market, urban finance; China. Consultant for the United Nations Population Division, 2007-08, research on internal migration in China and advice for World Urbanization Prospect projects. Co-PI, Hong Kong Research Grants Council, 2005-08, for a research project on China’s urban administrative hierarchy and economic development. PI, National Science Foundation, 1997-2002, Collaborative research on "Recent Migration in China and the Impact of the Hukou System". PI, Henry Luce Foundation, 1997-2002, research project: "Internal Migration in China: the Hukou System, Labor Market and Social Change"
Co-PI, Ford Foundation, 2000-2001, Chinese Public Policy Research Grant for a project on urban unemployment and migration in China. Chan, Kam Wing, Guest editor, 2003. Special Issue on Chinese Census 2000, The Chinese Review, 3(2), 197 pp. Chan, Kam Wing, Guest editor, 1996. Special Issue on Internal Migration in China, Chinese Environment and Development, 7 (1 and 2), 173 pp. Chan, Kam Wing, 1994. 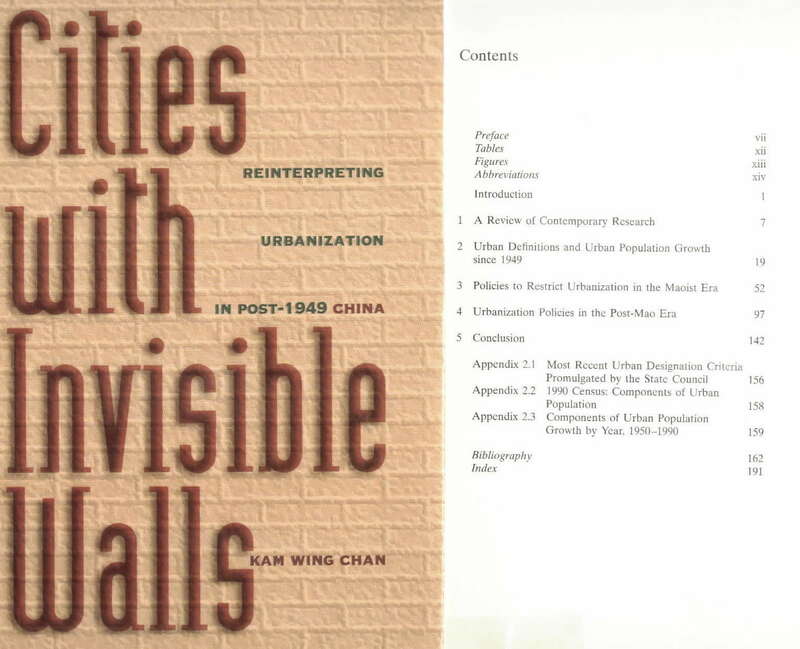 Cities with Invisible Walls: Reinterpreting Urbanization in Post-1949 China, Oxford University Press, 194 pp. Chan, Kam Wing, 2012. “Crossing the 50 Percent Population Rubicon: Can China Urbanize to Prosperity?” Eurasian Geography and Economics, Vo1.53, No.1, pp.63-86. Chan, Kam Wing, 2012. “Internal Labor Migration in China: Trends, Geography and Policies” in United Nations Population Division, Population Distribution, Urbanization, Internal Migration and Development: An International Perspective, New York: United Nations, pp.81-102. Chan, Kam Wing and Alana Boland, 2012. "Cities of East Asia," in Stanley Brunn, Maureen Hays-Mitchell, Donald Zeigler (eds. ), Cities of the World: World Regional Urban Development,5th ed, Lanham: Rowman & Littlefield, pp.470-521. Chan, Kam Wing, 2010. “A China Paradox: Migrant Labor Shortage amidst Rural Labor Supply Abundance,” Eurasian Geography and Economics, 51(4), pp.513-530. Chan, Kam Wing, 2010. “The Chinese Household Registration System and Migrant Labor in China: Notes on a Debate,” Population and Development Review, 36(2), pp.357-364. Chan, Kam Wing, 2010. “Fundamentals of China’s Urbanization and Policy,” The China Review, Vol. 10, No.1, pp.63-94 (download paper). Chan, Kam Wing, 2010. “The Problem with China’s Urban Population Data,” East Asia Center Newsletter, Winter, pp.2-3 (download paper). Cai, Fang and Kam Wing Chan, 2009. “Global Recession and Unemployment in China,” Eurasian Geography and Economics, 50 (5), pp.513-531 (download paper). Chan, Kam Wing, 2009. “The Chinese Hukou System at 50,” Eurasian Geography and Economics, 50 (2), pp.197-221 (download paper). Williams, Jack and Kam Wing Chan, 2008. "Cities of East Asia," in Stanley Brunn, Maureen Hays-Mitchell, and Donald Zeigler (eds. ), Cities of the World: World Regional Urban Development, 4rd ed, Lanham: Rowman & Littlefield, pp.474-527 (download chapter). Chan, Kam Wing and Man Wang, 2008. “Remapping China’s Regional Inequalities, 1990-2006: A New Assessment of de Facto and de Jure Population Data,” Eurasian Geography and Economics, 49(1), pp.21-56 (download paper). Chan, Kam Wing, 2008. “Internal Labor Migration in China: Trends, Geographical Distribution and Policies,” Proceedings of United Nations Expert Group Meeting on Population Distribution, Urbanization, Internal Migration and Development, ESA/P/WP.206, United Nations, pp.93-122. Wang, Enru and Kam Wing Chan, 2007. “Store Wars: Changing Retail Ownership in Beijing,” Eurasian Geography and Economics, 48(5), pp.573-602. Chan, Kam Wing, 2003. “Migration in China in the Reform Era: Characteristics, Consequences, and Implications” in Alvin So (ed.) The Chinese Developmental Miracle: Origins, Transformation, and Challenges (Armonk: M.E.Sharpe), pp.111-135. Yang Yunyan, Kam Wing Chan, and Ta Liu, 2001. "The Impacts of Outside Labor on Urban Labor Market," (in Chinese) Zhongguo renkou kexue (Population Science of China), No.2, pp.52-58. Chan, Kam Wing, 2000. "Internal Migration in China: Trends, Development and Scenarios," in China's Urbanization Strategy: Opportunities, Issues & Policy Options," (published by the World Bank and PRC State Development Planning Commission), pp.56-63. Chan, Kam Wing, 1999. "Internal Migration in China: A Dualistic Approach," in Frank Pieke and Hein Mallee (eds.) Internal and International Migration: Chinese Perspectives, Richmond, Surrey: Curzon Press, pp.49-71. Yang Yunyan, Kam Wing Chan, and Ta Liu, 1999. "An Analysis of Regional Migration in China" (in Chinese), Zhongguo renkou kexue (Population Science of China), No.73, pp.20-26. Chan, Kam Wing, 1998. "An Analysis of Consequences and Policies Concerning Recent Population Migration in Mainland China " (in Chinese), Journal of Population Studies (Taiwan), No.19, pp.33-52. Chan, Kam Wing, 1996. "Post-Mao China: A Two-Class Urban Society in the Making," International Journal of Urban and Regional Research, 20(1), pp.134-150. (download paper). Chan, Kam Wing, 1994. "Economic Development in China in the Reform Era: Environmental Implications," Chinese Environment and Development, 4(4), pp.3-24. Chan, Kam Wing, 1988. "Rural-urban Migration in China, 1950-1982: Estimates and Analysis," Urban Geography, 9(1), pp.53-84. Chan, Kam Wing and Xueqiang Xu, 1985. "Urban Population Growth and Urbanization in China Since 1949: Reconstructing a Baseline," The China Quarterly, No.104, pp.583-613 (download paper).